Faced with mounting domestic problems and diplomatic isolation to prolong its hold on power the leadership in Tehran is increasingly depending on the military establishment. Highlighting this growing dependence is the "Supreme Guide" Ayatollah Ali Khamenei who has held conclaves with the military chiefs on three occasions in less than a month during which signs of the military's ascendancy within the regime's power structures have multiplied. One sign was Khamenei's decision to ask the newly appointed Chief of Staff General Muhammad Hussein Baqeri to take over the key issues of cooperation with Russia and Turkey over Syria to the exclusion of President Hassan Rouhani and his administration. Baqeri has also launched an ambitious project for the creation of a de facto military alliance with Turkey, Iraq and Pakistan, with Russia as an outsider-supporter, in direct contradiction to Rouhani's repeatedly asserted hope of accommodation with Western powers. Another sign was Khamenei's decision to write a personal letter to General Qassem Soleimani, the man in charge of "exporting the revolution" through his Quds (Jerusalem) Force and the various branches of "Hezbollah" under his command in Lebanon, Syria, Iraq, and Yemen. In his letter, Khamenei credits Soleimani with having "destroyed" the alleged Caliphate (Da'esh in Arabic), and gives him the mission to pursue an even more aggressive strategy to extend the "recent victories" to the rest of the region. 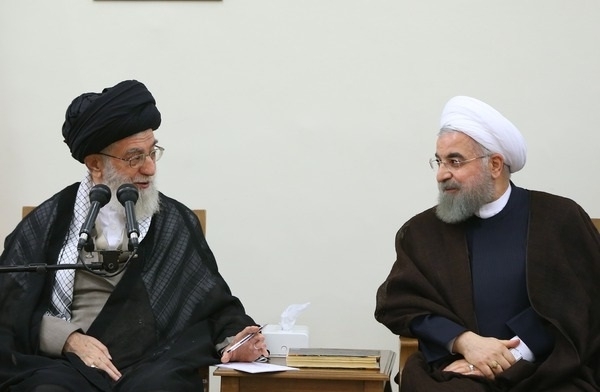 Once again, Khamenei's instructions make nonsense of Rouhani's repeated claims that Iran is seeking an end to tensions with neighboring nations. As of humiliating the official government on issues of foreign policy were not enough, Khamenei has asked the military to take-over the task of providing relief and, later, reconstruction in the recent deadly earthquake that shattered parts of five provinces. The implicit message, hammered in by Revolutionary Guards' Commander General Muhammad-Ali Aziz-Jaafari, is that when it comes to dealing with a major emergency, the civilian authorities are worse than useless. To emphasize the rising profile of the military in Tehran's power structures, Khamenei has ordered a whopping 14 per cent increase in defense and security budgets with a substantial rise in expenditure on the development of a new generation of missiles with help from North Korea. Here, too, the "Supreme Guide" rides roughshod over the official government's policy of trying to persuade the European Union and, hopefully even the United States, that Iran has slowed down in its missile projects as a goodwill gesture towards the P5+1 group which drafted the so-called nuclear deal. Meeting 52 top military commanders, including General Baqeri in Tehran last Sunday, Khamenei declared the armed forces to be" in the forefront" of what he termed " the victories of the revolution on all fronts." He also decreed that the military should have the first right of refusal in recruiting "personnel of the highest quality." Khamenei's growing reliance on the military may be tactically astute. The Khomeinist regime has lost much of its popular base and, judging by rising social and economic tension across the nation, is often on the defensive on domestic issues. The old narrative of the revolution as a Robin Hood exercise to rob the rich and give to the poor is exposed as sham. Official data clearly show that under the mullahs the rich have become richer and the poor poorer. Rampant corruption often highlighted by state-controlled media adds to the popular sentiment that a new nomenclature, firmly in place, is intent on robbing the nation on a massive scale. In the past few weeks alone at least 12 senior officials accused of embezzlement on an astronomical scale have fled to Austria and Canada. Growing unemployment, rising inflation and the plummeting value of the national currency punch further holes in any narrative of revolutionary success in areas that matter to the ordinary citizen. Thus the regime is developing a new narrative based on the claim that the terrorism that is rampant in so many parts of the world l most notably in the Middle East, is also threatening Iran and that only the military-security elite could protect the nation against it. "We are fighting away from our borders so that we don't have to fight in our cities," said General Hossein Salami, number-two to Gen. Aziz-Jaafari. However, at least in medium- and long-terms such a narrative is unlikely to produce the desired effects. In any properly organized and governed country the armed forces are not in the "front line" of the nation's fight for security, let alone survival. The "front lines" always consist of a nation's diplomacy, economic power, social cohesion and cultural appeal. In other words, a nation's military forces do not operate in a vacuum but in a broader context of socio-political reality. In that context, Iran today is more vulnerable than at any time since the 1940s. Khamenei expects the military to fill all the gaps created by decades of political and economic failure; and that is simply too much to ask. The "Supreme Guide" may also be wrong on another score. In any country the various institutions of state evolve at roughly the same level. You cannot have an excellent military and a third-rate civil service, judiciary and economy. Systems that solely focus on military excellence never achieve anything beyond transient success. One example is Sparta, which had the ancient world's highest-rated military, but disappeared from history whereas Athens, with its ramshackle citizen-armies, survived the Persian, Macedonian, Roman and Byzantine Empires. Another example was Napoleon Bonaparte, whose military machine set the whole of Europe ablaze while he ended in humiliation and death in exile. And who could fail to be impressed by the Operation Barbarossa, launched by Nazi Germany against the Soviet Union in 1941? And yet the end result was Berlin, the Nazi capital, as the biggest heap of ruins in history. In Iran's case, Khamenei is playing -- even overplaying -- the military card for narrow political reasons, at a time that Iran does not face any serious military threat to its national security and integrity. Beating the drums of war may sound exciting for a while; but, in time, its hollowness is bound to become clear. I doubt that it's possible for the mullahs to overplay the military card. They've created a Stalinist police-state to enforce and maintain their rule, and without the cooperation of the military, security services, etc. they would be out. The only way they maintain their control of the country is by force, and if they are to continue to rule, the force must be kept content and supportive. Khamenei siding with the losers! K is involved in the Venezuelization of Iran. K is getting old, very old and sick. Guess the mullahs weren't paying attention when Morsi's regime relied on its military to subdue an angry population. Dare we hope for an Iranian el-Sisi? Are comparisons in order of the Iranian military to the Nazi Wehrmacht, and the Revolutionary Guards to the Nazi S.S. (or the S.A.)? Just wondering...Whatever the answer, the States wishing to continue their existence in their present form, politically and/or religiously, had better combine to destroy the heads of the growing monstrosity now growing and metasticising in Persia. Where o where is the Iranian resistance? Do they even exist other than on paper? Will someone please tell Pres.Trump about the need to destroy the Iranian regime from within, as well as to oppose them strongly from without?